There’s almost a mysticism that surrounds railroading. And much of America’s love affair with the rails dates back to the 19th century and the steam engine. It’s a bit hard to figure out just why railroads capture our hearts – but they do. Steel screetching against steel as the engine trudges along the track. Dusty coal thrust into the firebox to keep the iron horse moving. And soot bursting into the atmosphere from the stack. But still, there’s a sort of glamour that’s unmistakable. That may explain why additional chairs were needed to accommodate the large throng of folks who showed up last night (10/5/10) to hear Rick Mills talk to the Spearfish Area Historical Society about trains. Mills, who in January became Executive Director of the new South Dakota State Railroad Museum in Hill City, didn’t disappoint. He gave an excellent overview of railroading in South Dakota – from those days when the transcontinental line came through Cheyenne (then a part of Dakota Territory) – right up through today. Still to be determined is the fate of plans for the old Dakota, Minnesota and Eastern (DM&E), now owned by Canadian Pacific, to haul coal through Edgemont and eastward across central South Dakota. 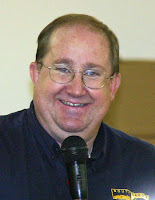 It would be hard to find anyone more immersed in his topic than Rick Mills. A native of Hermosa, he recounted his experiences as a youngster – accompanying his father on his rural mail delivery route – when he would get excited at the mere appearance of a train. It was often a Chicago & North Western train charging northward from Dakota Junction west of Chadron, Nebraska, en route to Belle Fourche. For young Rick, was to become a lifelong fascination with all things railroad. After attending the School of Mines, Mills worked for the postal service for seven years, followed by a 10-year stint with Simpson Printing in Rapid City. In 2001 he joined Visitor magazine and was involved in sales and production work. All the while, Mills’ enthusiasm for railroads has abided. That enthusiasm was readily apparent as he provided a succinct history of railroading in the Black Hills, reaching back to 1880 when Californian George Hearst – who had purchased what would become Homestake Gold Mine – arranged for the first steam engine to be brought to the hills. It was hauled across the prairie from Bismarck to Lead. Hearst’s mining operation then built the first narrow-gauge railroad in the Black Hills in 1881. In Nebraska, the Fremont, Elkhorn, and Missouri Valley (FE&MV) railroad extended west from Valentine to Chadron and Dakota Junction. By 1885, the line had built to the north reaching Rapid City and Belle Fourche. Although early rail development came rather swiftly across the hills, it would be several years before service came in to Deadwood. “The first North Western train arrived in Deadwood on December 29, 1890. And that morning, a steam locomotive came whistling into Deadwood, and the town was celebrating. About 150 miles down to the southeast, it was the morning of the massacre at Wounded Knee. The timing of that was so ironic,” observed Mills. He said 1890 marked the beginning of the “Golden Age” of railroading in the northern Black Hills. 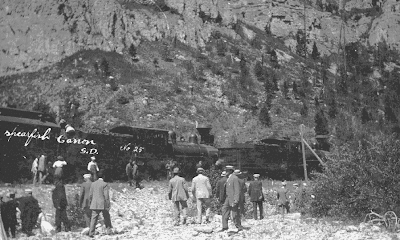 The Burlington line at Englewood made what Mills called a “torturous little trip” up to Trojan and Portland, then down Spearfish Canyon, winding its way along the east side of the canyon and onto the canyon floor into Spearfish. Rail service was also flourishing in Belle Fourche, where shipments of livestock began moving east by rail as early as 1890. Within just a few years, Belle Fourche became the busiest livestock shipping point in the United States. By 1906, a branch of the Burlington’s Edgemont to Deadwood “High Line” route went east from Mystic to join up with the Dakota & Wyoming route out of Rapid City. That link – along with other services in and out of Rapid City – fueled immense commercial development for Rapid City. Within a few years, activity surpassed Lead and Deadwood, and “they never regained it,” said Mills. But by the early 1900s, the internal combustion engine and the proliferation of “horseless carriages” started gaining popularity across the country – including the Black Hills. Within a decade or two, as automobiles and trucks emerged prominently on the scene, and railroads began to flounder. 1921 marked the end of narrow gauge lines in the hills. By 1930, all of the track around Terry Peak and adjacent areas were gone. Tourism was gaining favor across the hills, and families began to enjoy the convenience and mobility of automobiles. During World War II, tonnage hauled by rail exceeded all records, but it quickly subsided after the war. Development of interstate highways under the Eisenhower administration – along with growth of the airlines – inflicted a massive toll on passenger rail service. The last Chicago and North Western passenger train out of Rapid City departed 50 years ago – in October 1960 – and all passenger rail service was gone by the end of the decade. The ‘60s and ‘70s were tough times for the railroads. The languishing Chicago and North Western, for example, found economic woes and deferred maintenance giving rise to hazardous conditions. There was an abundance of derailments. One former C&NW worker in the audience recalled that during those gloomy years, C&NW was sometimes tagged “Can’t & Never Will.” Those were very tough times for railroads. But the 1970 merger of the Burlington line with the Great Northern, Northern Pacific, and the Spokane, Portland & Seattle railroads seemed to mark a new era. In the plains, with expanded coal mining operations in Wyoming, railroading seemed to come back to life. In 1992, the Burlington Northern merged with the Atchison, Topeka, and Santa Fe railroad, becoming Burlington Northern–Santa Fe (BNSF). Even the old C&NW line out of Belle Fourche, which was sold to Dakota, Minnesota, and Eastern and later acquired by Canadian Pacific, is keeping busy. “Sixty trains a day go through Edgemont,” he added. It was a delightful presentation for attendees, many of whom cornered Mills after the session for a myriad of other questions and comments. Others hovered over the 1916 rail line map of South Dakota. For more pictures and additional information about this program, visit our Spearfish History Gallery. To learn more about the South Dakota State Railroad Museum, visit their SDSRM web site or take a look at the video displayed in the upper right hand column. Society members and others are reminded that, because of the general election next month, the Spearfish Area Historical Society will meet on the second Tuesday in November rather than the first. Linfred Scuttler will expound upon “Old Newspaper Clippings” and offer us “the rest of the story!” It’s sure to be a pleaser – so make plans now to join us at 7:30 p.m., Tuesday, November 9th.